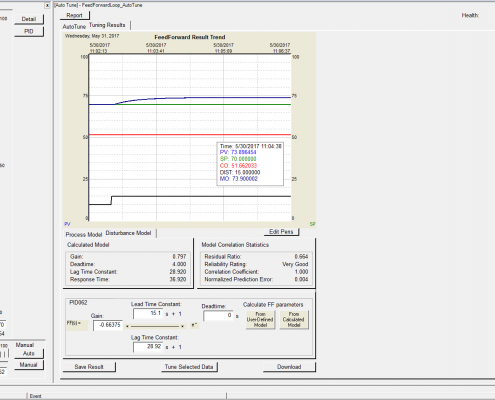 INTUNE® PID Tuning Tools is a collection of easy-to-use software tools that minimizes the effort needed to optimally tune your PID controllers. The ability to maintain all your process at optimal operating conditions translates immediately to huge savings in manufacturing cost and higher productivity. INTUNE software can save you over 75% of your engineering time over manual tuning. Use INTUNE software to tune PID controllers quickly and accurately, and monitor your process non-intrusively, round-the-clock, while you do other things. Or use one of INTUNE software’s other productivity tools to optimize and maintain the performance of your controllers. Generates PID parameter values for your process loops. Auto-Tune conducts a step tuning test on your PID loops in either manual or automatic mode. The software collects process data and analyzes it, and then identifies a model that represents the true process dynamics. Auto-Tune uses advanced Internal Model Control (IMC) based algorithms to calculate robust tuning parameters for the PID loop under test. Process models generated by INTUNE software can also be used to tune model-based controllers. Performs the tuning of both inner and outer cascaded loops in one test, eliminating the two-step manual tuning of cascaded control loops. Note: This functionality is not available in the INTUNE Single Loop version. Handles and characterizes multiple disturbances that can affect the control loop and its PV. Users can define multiple feedforward controllers on each loop. Users can switch between these two tabs to see the calculation results and the trend displays of the respective data sets. Feedforward tuning can also be performed on archived process data using Data-Tune. 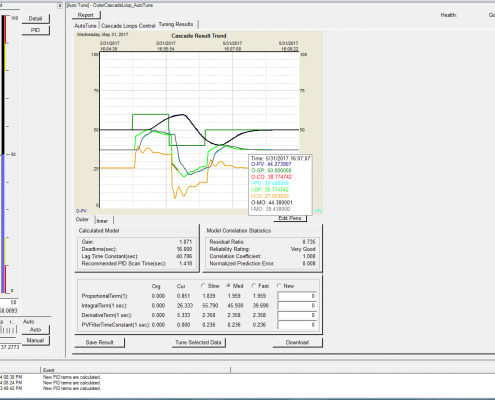 Once Auto-Tune has performed calculations, users have the option to download both the disturbance model and the feedforward parameters to the FF Controller. 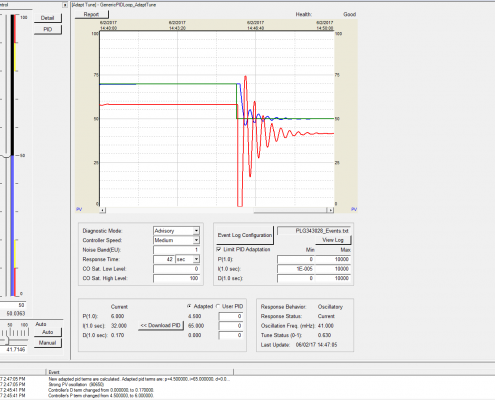 Detect abnormal process characteristics, such as controller output (CO) saturation or sluggish response to process load changes or persistent oscillations. Confirm all abnormal process characteristics, and logs activity with a time and date stamp. Advisory mode: Recommends PID changes and prompts operator to acknowledge and download. Use off-line with imported ASCII data to generate process models and suggest PID tuning parameter values. INTUNE typically requires a data file with columns of data containing PV, SP, and CO data. Use off-line for predicting the performance of your PID control using different PID factor settings. Automatically upload process models generated by INTUNE and perform “what-if?” type analysis, avoiding expensive trials on your real process. Use the Compare PIDs feature to simulate and compare the effects of up to four different sets of PID terms on your process—without intruding on or changing your process. 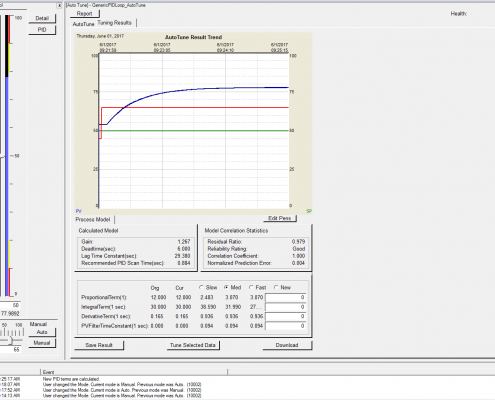 Access online, real-time simulation capabilities for PID and non-PID process elements. Provides reporting to document performance, tuning, and simulation, as well as your system configuration, device setup, and communications health. 14 different report types offer flexibility and convenience. Generate reports on demand, periodically, or based on an event trigger. Several reports offer ActiveX controls for interactive viewing of trends and key data. INTUNE software connects to most I/O devices and their associated controllers using OPC technology. The OPC client allows easy access to any control system through the controller OPC server. For the more commonly used controllers, INTUNE software automatically maps the parameters of the selected controller to the INTUNE controller object. INTUNE software maintains real-time connections with your process PID loops, and updates all process parameters at every sampling interval specified. INTUNE software is also its own OPC Server, so other clients have access to INTUNE software’s unique performance calculations and measures. INTUNE software interfaces with the OSIsoft PI System® to leverage valuable historical and real-time data that can be used to optimize PID controller tuning, for tighter control, improved product quality, and reduced scrap, with better and easier maintenance work. INTUNE executes on a PC with Windows 7 / Server 2008 / 8 / Server 2012 / 10 operating systems. Both 32-bit and 64-bit operating systems are supported. The PC may be one that already exists at site, conditional on meeting the requirements. * Does not include one-shot cascade tuning.